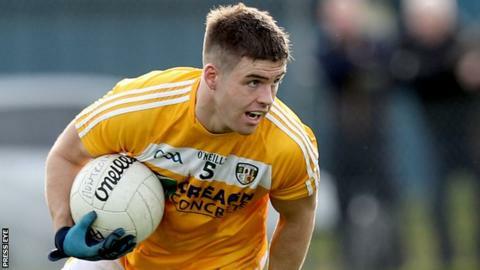 Antrim made a winning start to their Division Four Football League campaign as they comfortably overcame Leitrim 0-15 to 0-5 at Corrigan Park. The Saffrons led 0-6 to 0-4 at half-time before going on to dominate the second half at the west Belfast venue. Antrim keeper Chris Kerr did make a crucial save after shortly the restart to deny Darragh Rooney a goal. Keith Beirne's point was Leitrim's only second-half score as Paddy McBride top-scored with 0-6 for the Saffrons. Substitute CJ McGourty also hit three Antrim points with Conor Murray chipping in with 0-2. The victory meant a winning start to league action for new Saffrons manager Lenny Harbinson. The Saffrons suffered a disappointing last-gasp relegation last season and the new manager has made no secret that he is targeting an immediate return to Division Three.